The objective of the vacuum measuring carb synchronizer is to see that the vacuum signals from both carbs are the same. It is the difference between the signals and not the actual signals we are interested in however. The Rotax two stroke engine shows a signal of about 6" of mercury at idle measured against the atmosphere at its test signal port and a difference of about 1/16th to 1/20th of an inch of mercury can be read easily by eye. If lighter liquids are used like oil this signal would read as about 97 inches of oil requiring a very tall manometer gauge. With a senstivity of some 16 times greater than a mercury manometer, an oil manometer only needs to look at the difference. By hooking each side of the manometer to each of the carbs we have a very sensitive tool for synchronization. A 1/20th of an inch of mercury difference would show up as about 13/16ths of an inch of oil on the oil manometer allowing for even finer adjustment than possible with mercury. Attached is a photo of an oil manometer I made up with some cheap materials from the local Ace hardware store. I filled mine with air compressor oil since I did not have any two stroke oil around, but two stroke oil would be a better safety measure in the event of oil getting into a carb. For a total cost of $1.55 plus tax. The tubing was taped to the yardstick with transparent packing tape. 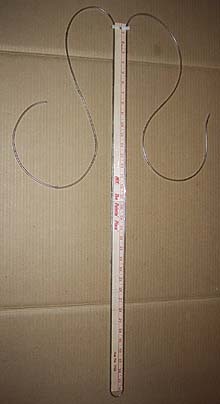 The wire ties were put thru the hole in the yardstick to secure the tubing on each side at the top. If desired a machinists or carpenters square and a pencil can be used to extend the 1/8" markings to both sides of the stick or the level of the oil on one side can simply be noted before testing begins since it must return to this point to be in balance. Fill with oil to about the 26 or 27 inch mark (36 at the bottom). You may have to leave the unit sit for a day or so to get all the bubbles out. If you are careful not to introduce air when filling this is less of a problem. When in use with the engine running both lines must be connected, one to each carb. The oil will be sucked up and out of the manometer if only a single carb is connected and the other end is left open to the atmosphere. This device is so simple and cheap to make, I thought it best to just tell everyone how to do it rather than try to make and sell them. Bing's claim that their $34.95 mercury device is the most accurate carb balancer regardless of price seems to ring hollow doesn't it? I will try this unit as soon as I get a chance. If any of you beat me to it, let me know how it works for you.